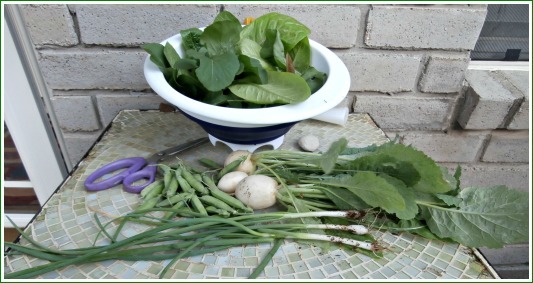 Another evening’s garden pickings: lettuce, peas, turnips, and a few green onions. On this last day of the month, another front came through this afternoon bringing in a cool spring wind from the north, but March is hardly “going out like a lion.” Though we’ve had other storms come through, not much precipitation has come with the wind. Despite the lack of much rain, the little garden behind the garage has been producing fresh vegetables for supper. The turnips, especially, have been delicious, whether raw or cooked. The beans I’ve planted haven’t come in very well, and i don’t know whether I will fill in with more. In reality, fresh, store-bought beans taste pretty good, and there’s no bending over to pick them. 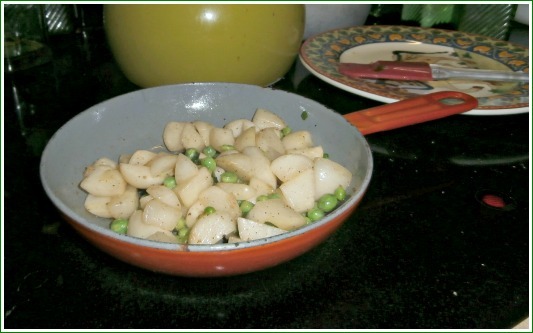 Green peas and turnips sautéed with some bits of green onion, all fresh from the garden, make for a delicious veggie dish for supper. Summertime and the Feelin’ Is . . . Tomatoes from my garden–I had quite a variety of shapes and sizes. The dark red one on the right is a Cherokee Purple, and they are some of the most delicious tomatoes I’ve tasted in a long time. There are not that many tomatoes left on the vines, though this recent bout of rain and cooler weather may help for more to set on. 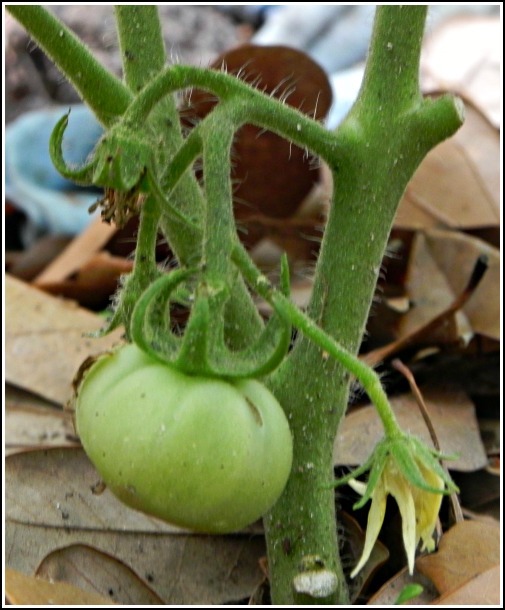 If the hot temperatures come back, the tomatoe season may be over. I’m definitely missing writing, but I guess other things have just gotten more emphasis as of late. These photos show a bit of what’s been going on. 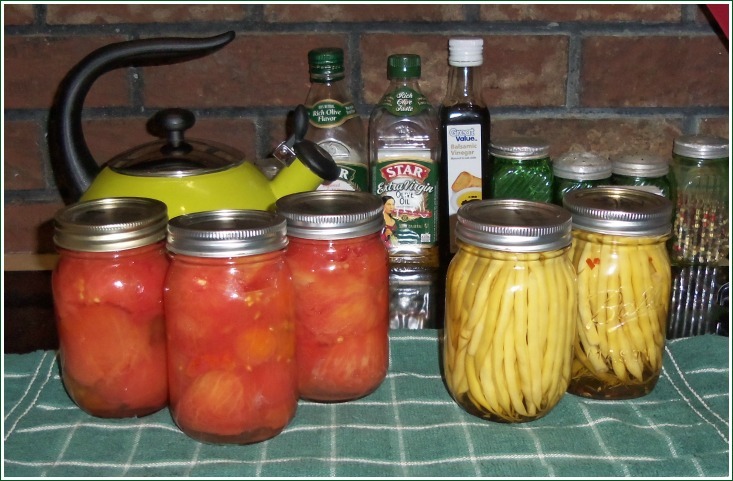 Tomatoes and pickled beans–These are just some of the jars of vegetables that I’ve canned this some from what’s come from my garden. Pickled beans are a family tradition. From the fresh tomatoes, I’ve canned also canned hot salsa and tomato sauce. My backyard one Saturday morning–The hose is evidence that this is before all the rain started. 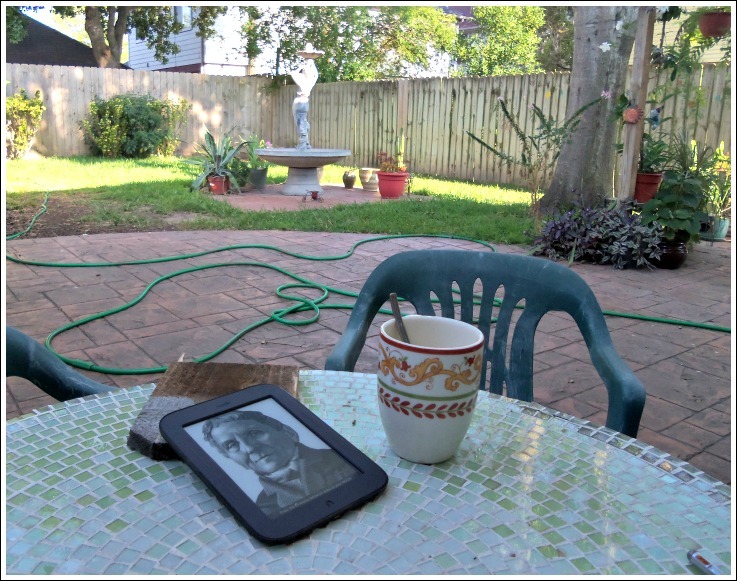 It’s a peaceful place to enjoy coffee and try to read something on the new Nook. I say “try” because there are too many plants to tend or better yet just sit and enjoy the morning. 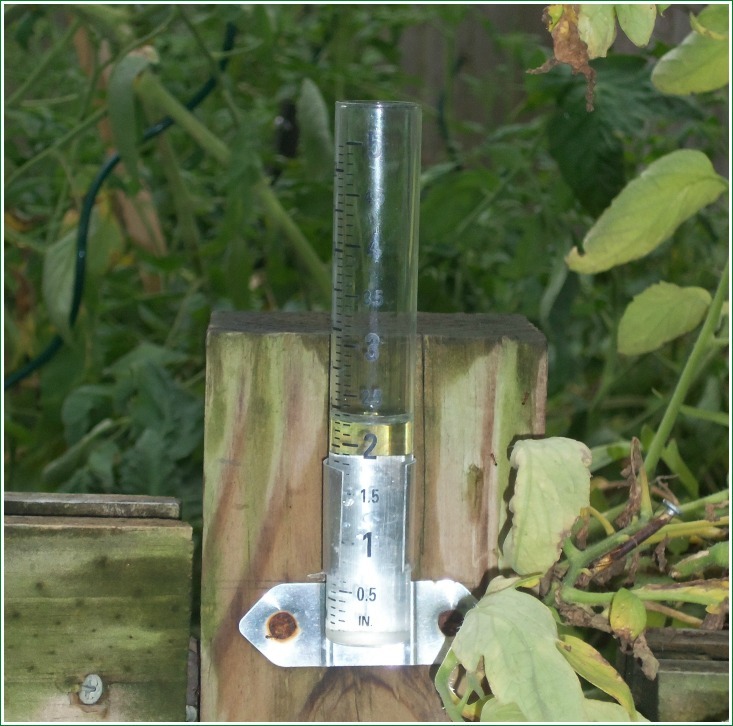 Yesterday’s rain–The rain guage showed 2.40 inches yesterday. With what has come down today, I estimate between 8 and 10 inches has fallen at my place in northwest Harris County since noontime this past Sunday. Another Weekend of Rainy Weather, But Really, Who Can Complain? 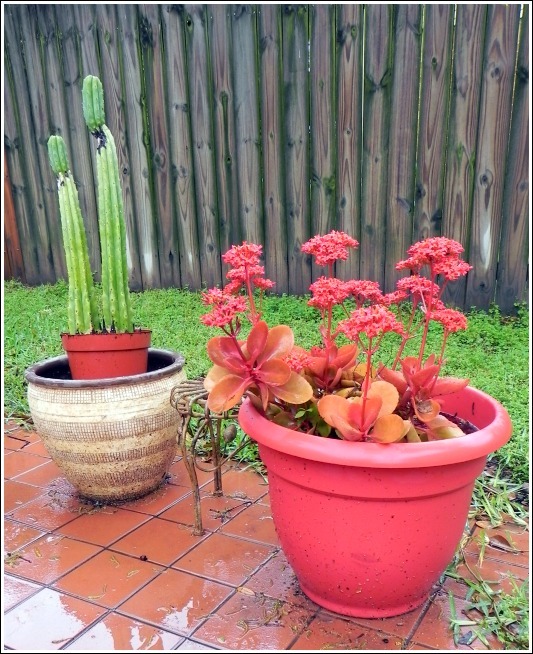 Because this pot retains so much rain water, the flowers on this kalanchoe have turned a more piercing red than usual and the leaves and stems are also turning red. Am I the only one who thinks that time change days frequently have some kind of inclement weather that helps add to the confusion? I woke up to light pings of rain drops hitting the window. When I could no longer ignore Annie’s staring at me from only a few inches away from my face, I got up to take her out. By this time, the shower had just about ended. Slogging through the wet grass, I found .40 of rain in the gauge to add to the 2.60, which had accumulated from Friday afternoon through Saturday. After the long drought of last summer and fall, a rainy weekend is still something to enjoy. 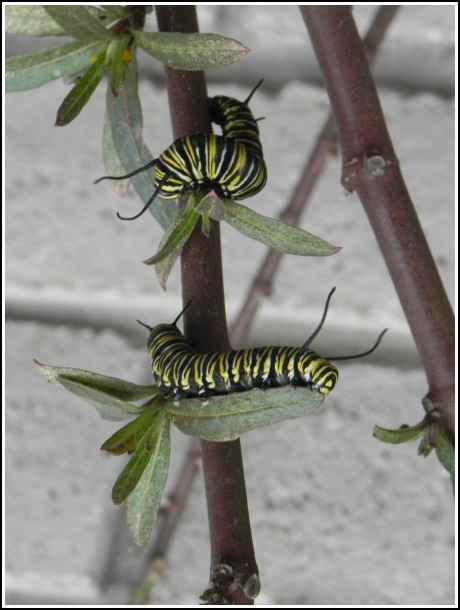 All the plants–trees, grass, garden vegetables, and, for sure, the weeds–are making up for lost time. The pine trees in my neighborhood are thick with baby cones. The verbena in my south bed are lush with purple and pale blue blossoms. When it comes to my little garden, I’m sure I’ve over-planted this year, because with all this good moisture, every little sprout wants to grow. The peas are climbing the menagerie of trellises and string I’ve put up. The lettuce, though a bit trampled by the rain will soon be ready for a first cutting. Pole beans are popping out of the ground and stretching up. 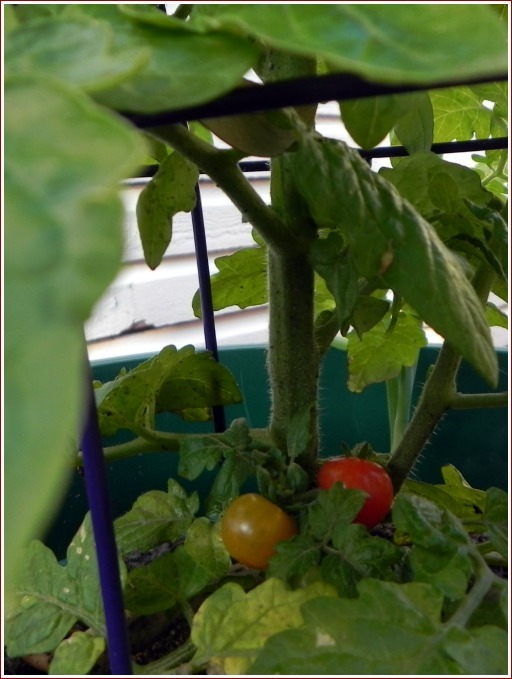 Then there are the tomatoes. I’ve set in more than any other year. If all of them produce, I may have to start my own salsa company! With all this gray weather, yesterday was a good day to cook and warm up the house. I found a good buy on a pork roast, which I braised in the skillet and then set into a baking dish loaded with cabbage, potatoes, celery, onions, carrots, and a few spicy peppers (these last from my garden–planted last year). In the skillet with the meat bits left from the braising, I reduced a pint of orange juice, which I then poured over the meat and veggies, before putting them into the oven to roast. I have to say, the end result was enough to raise my eyebrows–great food for a gray weekend. String lines to give the tender pea plants something to grab onto to keep them up out of the wet soil. 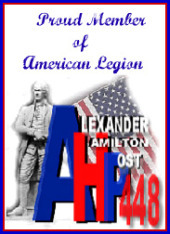 As gray and cold as it is outside, one can almost believe the prediction Punxsutawney Phil’s prediction that spring won’t come for another six weeks. 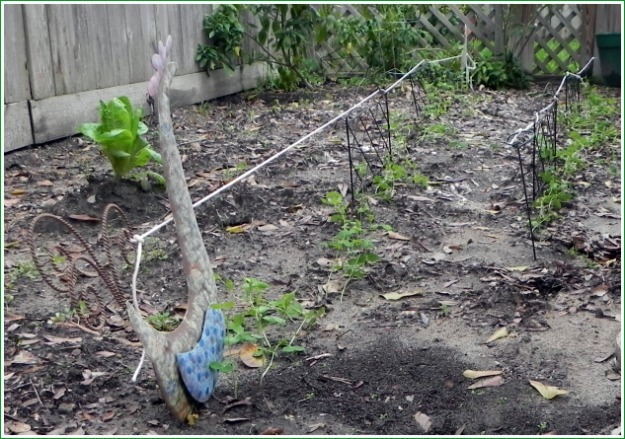 Despite the mid-40s temperature, I put the coffee on and went outside to tend to a much-needed task in the garden–putting up some string lines for the peas to climb on. This year is my first to try peas, and I’ve found that the stems of pea plants don’t have the strength that beans have. 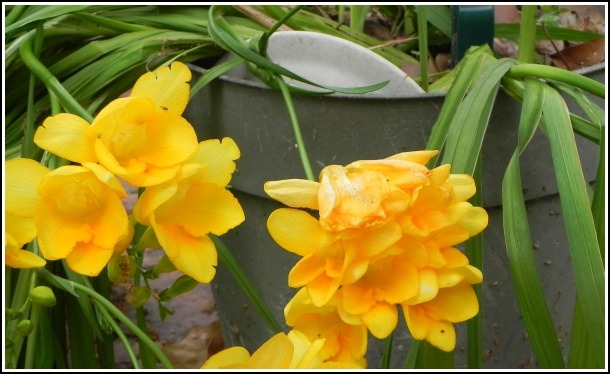 Consequently, after the rains of the last several days, most of the plants were flattened onto–thankfully, not into–the ground. 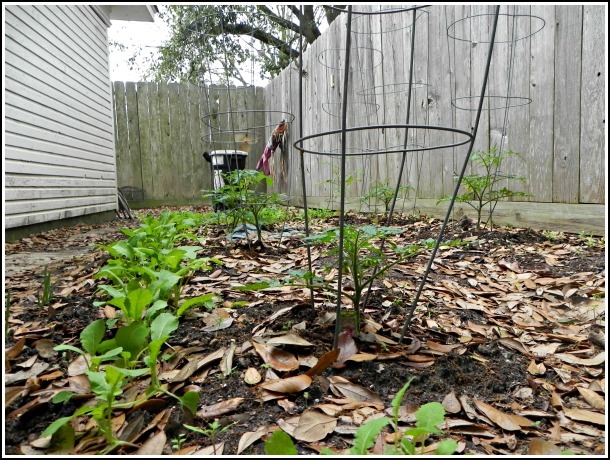 Still in my red plaid flannel pants and a hooded sweatshirt (yeah, I don’t say “hoodie”), I rounded up some heavy string, my garden chickens, and a few mini-trellises and rigged up some support for the plants, which already have tendrils ready to grab on. 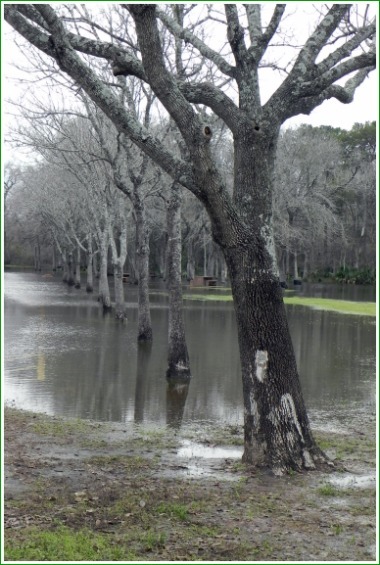 Standing water from recent rains has caused some of Bear Creek Park's roads and picnic areas to be closed. There’s still no sun out. Since Christmas, it feels like we’re back in the groove of having more typical Houston weather. I’ve started checking a site that shows the severity of the drought across Texas and the U.S. Over the past week, my rain gauge has collected about 2.5 inches of rain, a lot of which came down early yesterday. If the ditches, empty lot, and open fields are any indication, maybe the drought here in southeast Texas has been broken. I hope that all the trees are getting a good, healthy drink. 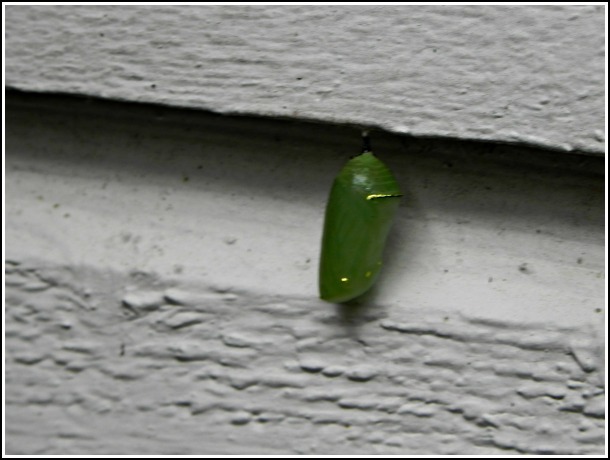 Too many others didn’t make it through last year’s long hot summer and fall. Planted 2 weeks ago, these pea sprouts are about 4 inches tall. Again it’s garden time! I know it’s still January, but last year I planted on the 1st, but this year I didn’t get seeds for some leafy greens into the ground until the 15th. In addition, to various kinds of lettuce, I also planted spinach and peas for the first time. The rows of the little sprouts have aleady appeared; in fact, the peas are now about 3-4 inches high. The 2.75 inches of rain that fell may have washed some of the lettuce and spinach seeds around, but according to national figures, we’re still not out of the drought yet, so whatever rain comes down is needed. This year I used one of my gift cards to help purchase a roto-tiller. 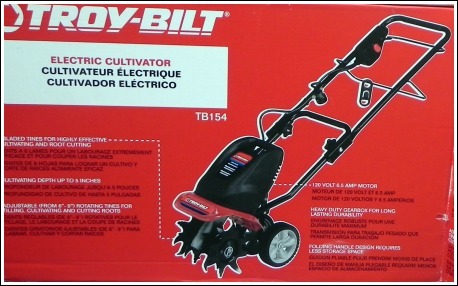 For quite some time, I had been eyeing a Troy-Bilt Electric Cultivator at Lowe’s (Model TB154). After I got it home, the minimal assembly was a no-brainer. Very similar to my electric lawn mower, there were just two, hand-grip bolts, which attach the upper part of the handle to the rest of the tiller. Attach the handle with these hand-grip bolts, and the tiller is fully assembled. with a rake still didn’t break up the soil satisfactorily. Using this cultivator really got the soil worked up to a very good depth. For a smaller machine, and an electric to boot, the Troy-Bilt154 is surprisingly powerful. For a first-time tiller user, there was about a 5-minute learning curve, because the machine really wants to get into the dirt and do its job. Just because this cultivator is lightweight doesn’t mean garden-tilling with it is something that your 11-year-old kid should be doing! I paid $199; it had been on sale for about $20 less before Christmas. Like the rest of my outside power tools, this tiller is electric. Check out more extensive reviews at Lowe’s. OK, so this is just the side of the box, but I didn't take any photos out of the cultivator out in the garden, and I'm not pulling it out from it's corner in the garage just to get a pic.